You know how they say "A dog is a man's best friend?" Well, we came up with our own, kiddo-centered version: a teddy bear is a toddler's best friend. It doesn't really roll off the tongue the same way, we know, but it's true, all the same! Your child won't go anywhere without their special bear, and now they won't have to—even on Halloween! This Toddler's Teddy Bear Piggyback Costume will delight your kid with its whimsical illusion...it really looks like a teddy's giving your kiddo a lift! A beloved stuffed animal is meant to support your little one through thick and thin, so this costume takes that comfort and special bond to a whole new level. It doesn't hurt that this look is bound to land your kid with all kinds of trick-or-treating loot—people just love to reward an original costume with an extra candy bar or two! This clever costume combines humor and adorable style to give your little one a look they won't want to take off. The suit gives the gleeful appearance that a stuffed teddy bear has hoisted your toddler on its shoulders for a victory lap around the neighborhood, when in fact, your child has stepped their legs into the brown, faux fur bear ones and is walking around on two paws! 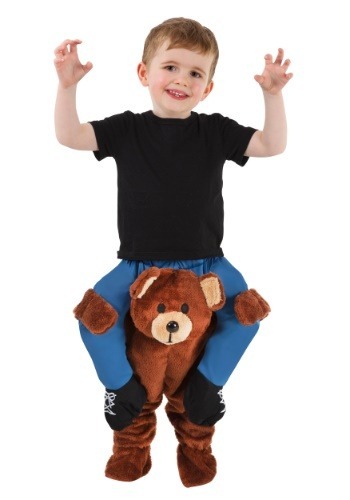 Stuffed "denim-clad legs and shoes" are attached, and seem (to the untrained eye) to be hugging the bear for balance and stability. Talk about a supportive little toy! This teddy has been pumping iron and eating its spinach to get strong enough to carry your kid through Halloween night. When the candy has been collected, the allotted amount consumed, the candles in the Jack-o-lanterns extinguished, and the sugar-high worn off, your child will drift off to dreams with cozy thoughts of their big night out with their best friend, Teddy! Don't be surprised if you find them cuddling this costume in bed next to a pile of candy wrappers!